Babies create lots of messy diapers in their first years, so you’ll need an easy, effective way to dispose of all that mess. 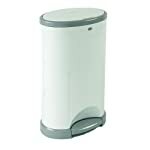 There is no reason why you should not have a handy nappy disposable bin to help you do your job well! If not, you will be constantly changing the wastebasket whenever you have a soiled diaper to keep odors down. Whether you choose a simple trash can or a high-tech, odor-eliminating diaper disposal system, there’s a diaper pail out there to meet almost anyone’s needs and budget. As you know, changing a poopy, stinky diaper is probably not the highlight of your day, but it must be done. What you really need is a way to keep those dirty diapers out of sight and out of mind easily. Odor control and convenience are extremely important to have in a diaper disposal system, but which one is the very best? You want something that is best suited to your needs to help you stay as close to the baby as possible while changing them. If you have to bend down too much it might become difficult and at the same time you should not have problems opening up the top cover. While it is true you do not want to spend an arm and a leg on the newest and hottest nappy bin, you still want something that works well enough to make your life just a little bit easier. Take a few minutes to examine the nappy disposal bin and note how the system works. Does it use special bags that seal the diapers into an individual space? Does it use standard trash bags and an air filter to reduce smell? Do you want to purchase extra bags and accessories in order to make your diaper disposal system work? For some parents, buying these extras is not a hassle, but some find it frustrating. Also be sure that you can operate any moving parts easily, as some nappy bins have a top that you must flip or turn to dispose of the diaper. Changing the bag in your baby’s nappy bin is not going to be pleasant no matter which system you choose. Some nappy bins may have small bags that require daily changing. Other diaper disposal systems have large capacities that allow you to wait several days to change the bag. Each side has its own disadvantage – you either get to deal with the nappy bin daily, or you deal with increased stinkiness and more diapers a few days later. Will It Really Keep Your Nursery Odor-Free? Some nappy disposal bins really do a great job of keeping the diaper smell from escaping into the nursery, so a high-tech nappy bin is a worthy purchase for some parents. It’s hard to keep the smells from happening altogether, though, so if the diaper disposable system keeps odors from escaping, you can imagine that when it’s time to change the bag, the smells have collected inside the bin and sometimes don’t want to leave at that point. A stick-on deodorizer or some crumpled newspapers left in the bin for a few days may help, but the bin is full of smelly diapers, after all, so you can’t expect it to smell like roses. Diapers are pushed through an opening and past a clamp-like device. 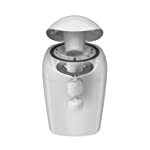 Diapers are placed in an opening, and then you need to move a handle which pushes the diaper down into the bin. For dry use with disposable diapers, only a regular trash bag is necessary. But be aware that cotton diapers that are wet will require at least a double bag. Most wet diaper bag holders are sealed, which is not the same as a normal trash bag. The most popular features of the best diaper pails include foot pedals for one hand use, sealed lids to prevent smells, deodorizing disks or charcoal filters, and easy bag removal. Nappy disposal bins after a while smells very nasty. There has been many a parent who choked and gagged her way to setting out the weekly garbage. What’s worse – after a while the stench seems to infest the bin itself and the thing stinks even when it is empty. While there is no fool-proof way of keeping your diaper pails smelling like something other than a diaper pail, there are some things that you can do to help keep stinky odors at bay. Use nappy bins with a plastic liner. Throw poopy diapers directly out in your outside trash can or plop the poop right into the toilet before tossing in the nappy bin. Sprinkle baking soda in the bottom of the bin and pinch in a little at every diaper change. Take the diapers out to the outdoor trash and treat you nappy bin to a dousing of an antibacterial spray, like Lysol, at the end of the day. If baking soda isn’t helping to cut back the odor, try tossing other strong-smelling items in the bottom to help mask the odor. A per-measured coffee filter, a few whole cloves, a drier sheet. You might be surprised that one of those helps. Once the odor has leached into the porous plastic of the bin, it can be very difficult to evacuate that unwanted smell. While it can be done, the problem is that some of the chemicals used might erode the plastic of the pail. Obviously, they can be harsh to use on both the pail and the person nominated to do the cleaning. Always test out an area of the plastic first and use wise safety and handling precautions with cleaners. You can try and sanitize your pail with good, old-fashioned chlorine bleach. Take the pail outside with a bottle of bleach and a large resealable bag (like the Ziploc bags used for storage of large items). Pour the bleach over the bin, coating it inside and out. Seal up the bag and let the bin steep in the cleaner for a day or two. Be sure to open the bag up outdoors, being mindful that the bleach doesn’t get on to your grass or plants. Give it a good scrub and hose down. Hopefully, that will have been what you needed to combat the smell.